Michael McFadyen's Scuba Diving - Dee Why Wide The northern beaches of Sydney do not have many good shore dives. The reef along this section of Sydney's coastline drops straight from the rock platform to shallow sand in a very short distance. 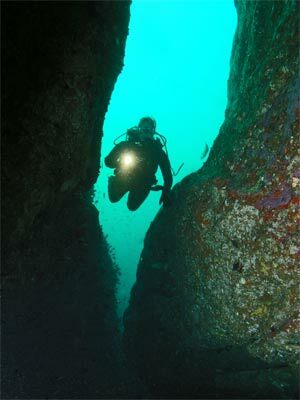 This is unlike the section of coast south from Sydney Harbour which has excellent shore dives and where the reef extends a considerable distance and sometimes reaches almost 30 metres deep. The northern side is different when it comes to boat dives. 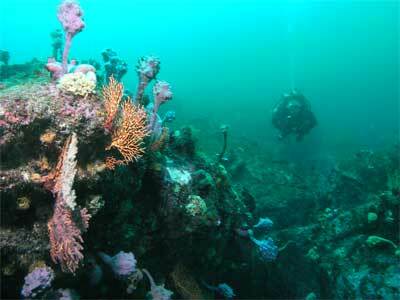 While the rock platform drops to sand quickly, further out there are reefs that drop deeper. South of the Harbour, nearly every section of rock platform drops to sand and that is it. Further out there are no more drops to reef. 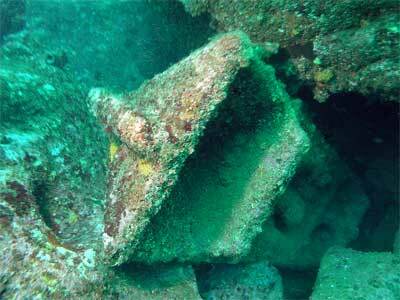 As such, you can strike reef many kilometres out to sea off the northern beaches, even as far as the wreck of the SS Myola (which is why it lay undiscovered for so long). One of the best reef dives in Sydney and certainly one of the best on the northern beaches is Dee Why Wide. This is not, as you would imagine, located off the suburb of Dee Why, but located 2.4 kilometres off Curl Curl Beach. Dee Why Beach is actually located 3.0 kilometres north-west from the dive site. From Sydney Harbour (the closest protected boat launch spot for most boats), head north for almost 6.5 kilometres to GPS Reading location is 33° 46" 16.3'S 151° 19" 14.8'E. Note that all the GPS Readings on my Web Site are taken using AUS66 as the map datum. If you use another datum you may be about 220 metres off the wreck. See my GPS Page for more details and how to convert readings. Visual marks are two orange silo like structures to the west on the edge of the headland at the northern end of Curl Curl Beach and the large block of units to north-west in line with the dip in the skyline above. Run in from the south or east and you will pick up the bottom coming up from 32 metres to 23 metres at least. Anchor on the edge if possible as the top can be quite flat in spots. If you have anchored as above, you will be on the south-eastern corner of a section of the extensive reef that runs to the north and west from here. 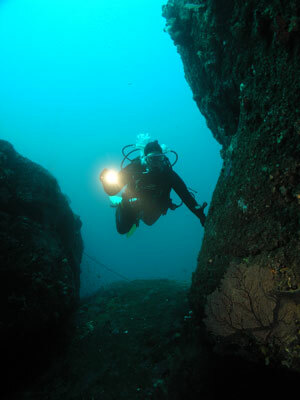 In this location the reef top has many cracks that run north-south and east-west. More about these later. Start the dive by dropping to the deeper parts of the reef. There are some larger gullies that run from the reef top to the south and these drop to 30 metres. Out here there are heaps of large boulders that lie on a rocky bottom. There may be a sandy bottom further out but I have not seen this. 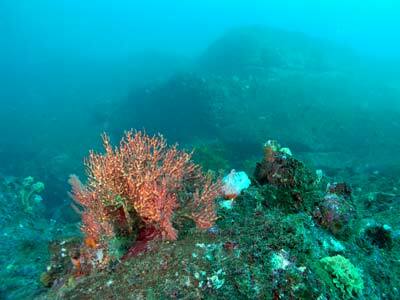 The boulders have small gorgonias, heaps of sea tulips, small sponges and other fixed growth. There are lots of small overhangs in the spaces under the boulders. After exploring the boulders, head back to the main reef and you will see a number of cracks that run north into the reef top. The second or third one from the eastern end is very interesting and well worth exploring. It drops to 28 metres and opens up into a cave either side of the crack. This cave has some eastern blue devilfish and lots of ladder-finned pomfrets. Come out of the crack/cave to the south and follow the wall to the east. Go past the next crack and you will soon turn to the north. About 15 metres along there is another crack that runs east-west. This crack has what appears (at first glance) to be a large rock blocking the entrance. Look closer and it is obvious that this is a man-made structure. It looks like a hopper or scoop from a dredge or front-end loader. However, this is not correct. Have a look up over and behind and it will soon be apparent what it is. It is in fact a very large anchor. The stock runs back up the crack and is broken off. The flukes of the anchor are easy to figure out. The anchor sits on its side. How it got here I do not know but it obviously got stuck and the top of the stock broken when the large ship (as it must have been to have an anchor this big) tried unsuccessfully to extract it. You can go further north to explore other cracks and then on the way back explore the ones you have already passed. Fishlife that can be seen includes kingfish, leatherjackets, yellowtail, seapike and other species. Visibility can be very good, up to 30 metres at times, but more likely 10 to 15 metres. 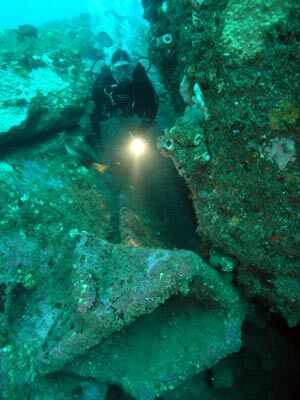 A really fantastic dive site.